GOLD WEEKLY: Using cycle timing, we should be close to a low for GOLD, but I am expecting an ICL. An ICL is a quick sharp sell off into a low, and then a move higher. It shakes out the bulls. I have pointed out Prior ICL’s on the chart below, and you can see that they come roughly 4-5 months apart lately. We are 4 months from the ICL at the end of May, and I have been calling for a Deep Meaningful Trade-able LOW at the end of September / early October for several weeks. Here I am pointing out the 1 week deep candle in May that came out of nowhere. Couldn’t we get that on a Fed Week? I drew that one in September in as an idea of what we might see this week. I am trying to be patient. 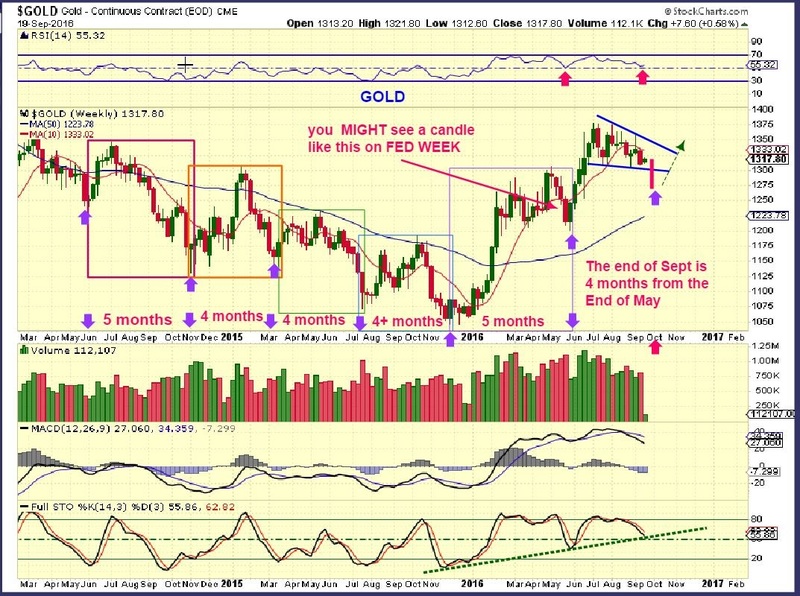 GOLD DAILY – I’m being asked if Gold can put in a short daily cycle here, near day 14 or 16 or so. Yes, anything can happen, but I have to report what is more likely to happen. I am being patient, because we are on day 11, and that is definitely early in the daily cycle. An ICL would also be a deeper drop. Since Golds daily cycles can be continue for 0ver 20+days until a swing low arrives, I want to wait for that swing low. The FED MTG could cause a sell off depending on what J. Yellen says. Rate hike or no rate hike may not be the trigger, it may be what she says. 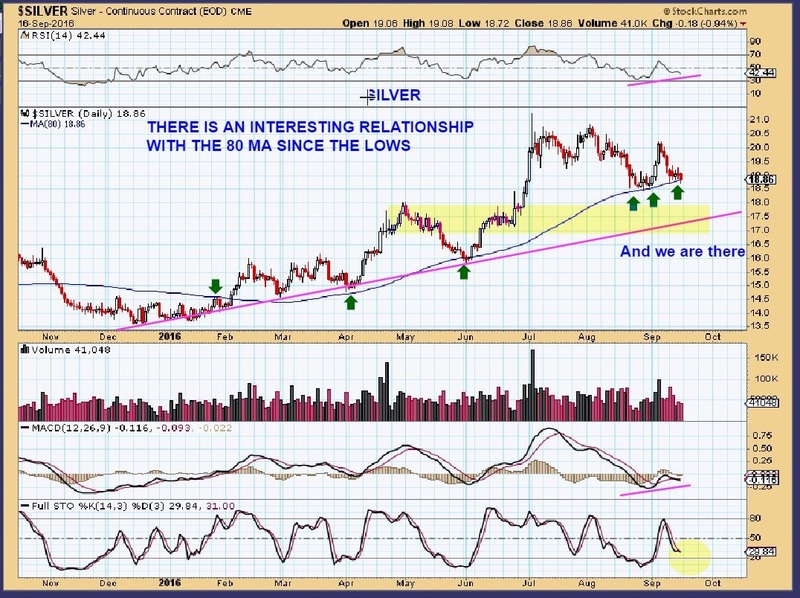 SILVER – I posted this in the premium reports chat section Monday morning. Has Silver bottomed ahead of Gold? 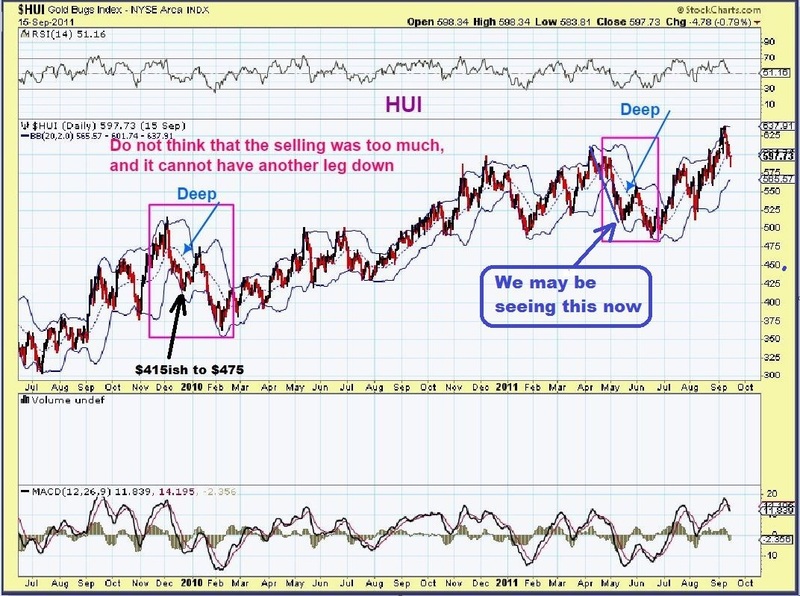 I am waiting for a deeper sell off in Gold, so it is hard to recommend Silver long, but this does give a low risk entry for experienced traders with a tight stop. NOTE: A steep sharp ICL type sell off could quickly drop Silver to the magenta line, so caution for some is prudent. 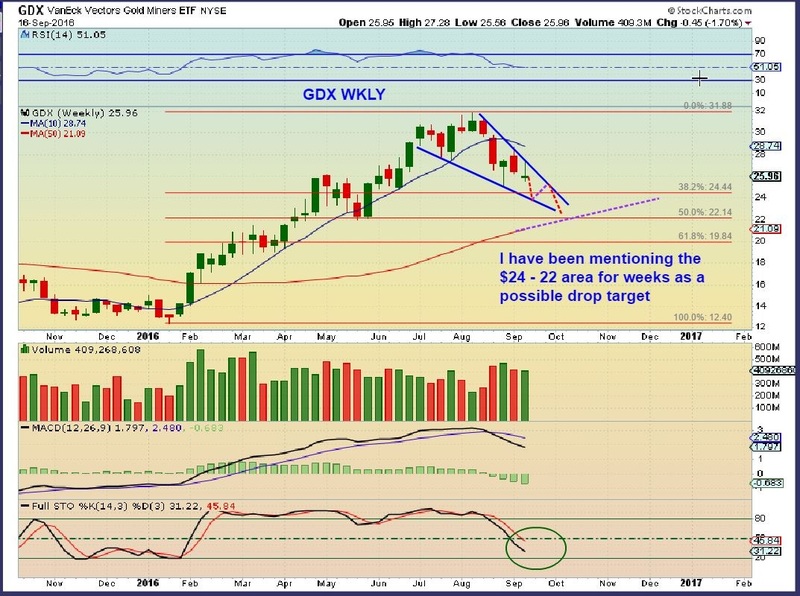 GDX WEEKLY– I pointed this out in the weekend report as a possibility. Sentiment is finally at a point where the majority do not want to own Miners again. This is what happened right around ICL’s. 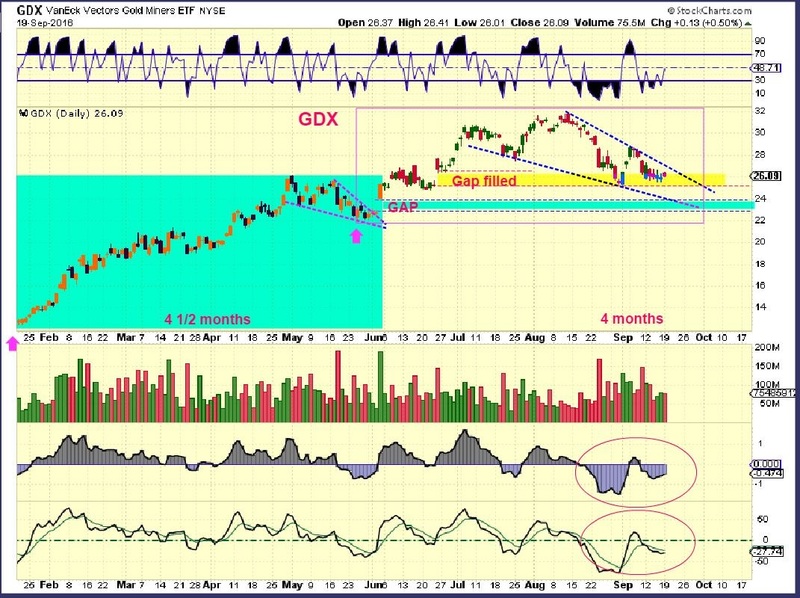 GDX DAILY – Day 11. Did we just see an ICL type sell off in Miners with that big sell off into September? It does look like it in a way, but it is still unusually early timing-wise for an ICL, so I advice caution & patience. So far, it is lingering at the lows. It is a lower risk entry here, but if you enter a position here, there is also a risk that the FED MTG Wednesday would break the lows and shake you out in a sell off. Over a week ago on Sept 9th, I pointed out that the bounce that we were seeing would likely roll over like this and not continue higher. That is what we are seeing so far. Some wrote to me and mentioned that the sell-off in August seemed deep enough. So could we really drop again? A week ago, I also used these examples in the HUI (2010 & 2011) of a deep drop, a bounce, and a 2nd deep drop into an ICL as a visual example. With the Fed Mtg Wednesday, Cycle timing a bit early for that deep meaningful ICL, and evidence that the HUI has dropped in more of an ‘a-b-c’ type wave down in the past, I just want to admonish patience for those who cannot endure drawdown. 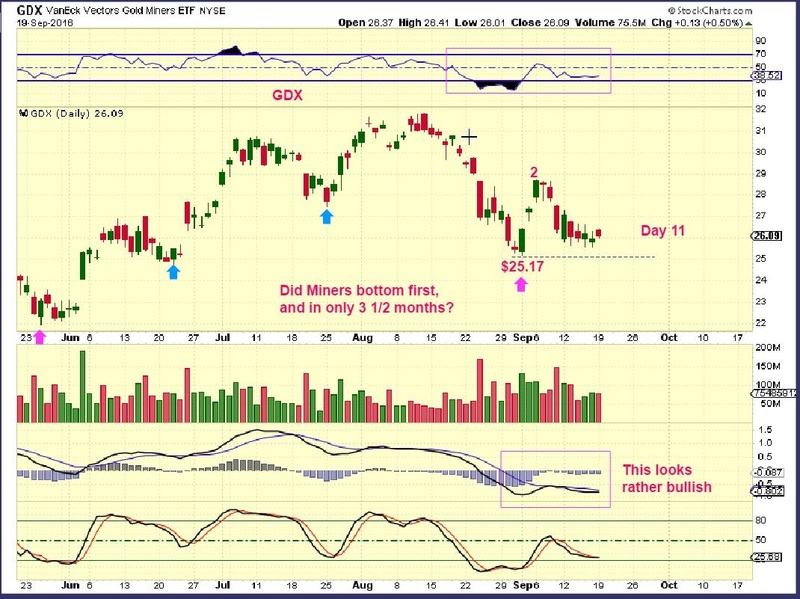 SIDENOTE: GDX – We do have a gap below price currently, and if we sell off into an ICL here, it could get filled. I have been calling for a drop to $22 – $25 for many weeks now. One more quick fed sell off would do the trick. THIS IS ACTUALLY setting up to be a BULLISH looking chart right now , with divergence & a falling wedge pattern. A buying opportunity is near, even if we get a big drop. 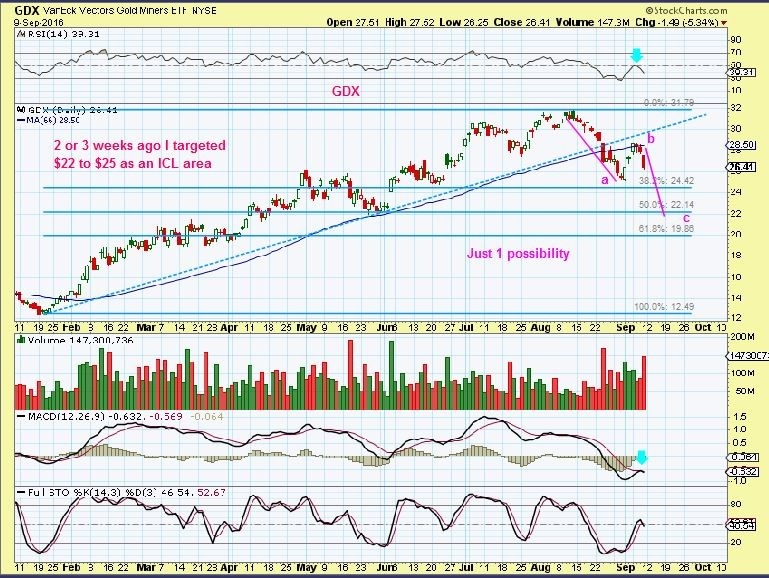 So a common question that seems to come up lately is, “Can I take a position here and just ride out the wiggles?” If we drop to an ICL and it is only GDX $22, that is possible if you are experienced, but I find that many CANNOT stand to watch their account values drop for even 1 day or 2. That is why I recommend patience as we head into a Fed Meeting, and waiting for a swing low. Could that recent sell-off be THE ICL in Miners, and the Fed Mtg blasts miners higher? I never say never, and if so, we could always take positions then, but it is less likely timing-wise. Gold did not sell off nearly as much, and if Gold sells off inot an ICL, I would think that Miners will at least double bottom or undercut the lows. I do expect another strong move higher soon enough. That said, here is something that I find encouraging – Some Miners are back up near their highs, and I found that interesting with that deep sell off in August. Notice GORO. This is what Miners can do. 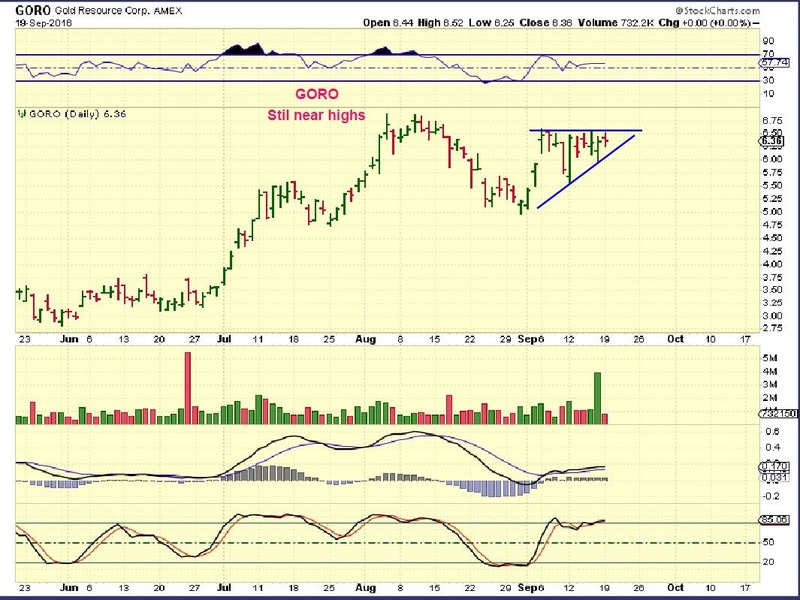 In 3 quick days in early September, GORO took back 3 weeks of selling off. 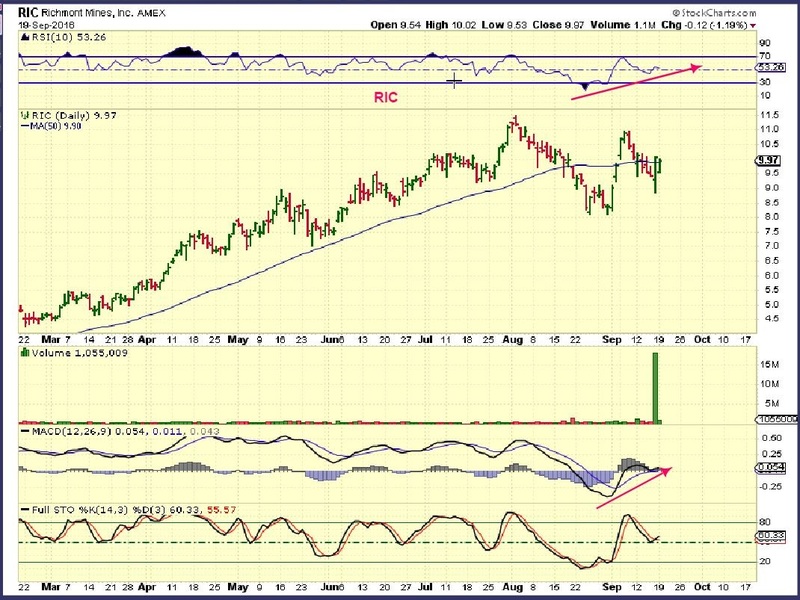 And RIC looks pretty good since the August sell off and rebound. It ran from $8 to $11 and shows positive divergences. It now has another reversal and attempts to regain the 50sma. SO SOME MINERS may have bottomed and they may not break their current lows. Again, 3 quick days took back 3 weeks of sell off. 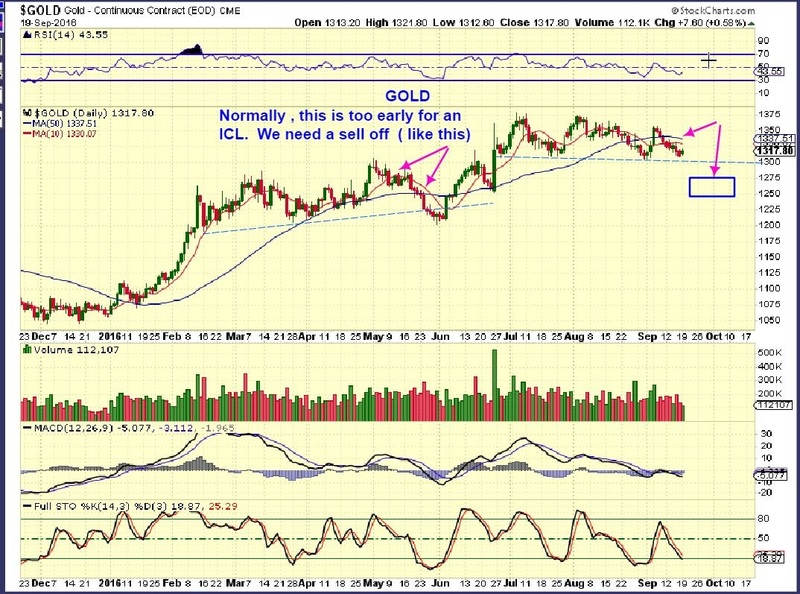 SENTIMENT is in the dump when it comes to precious metals -- and that is what we want to see at an ICL. Some Miners still exhibit weakness or lack of real follow through, but as we see with GORO and RIC and a few others, some Miners are possibly being accumulated. Recovery can be very quick after the selling dries up. If you want to track the precious Metals market along with us here at Chartfreak, why not sign up for a 1 month or quarterly subscription? When the lows are in, I believe that you will easily make your money back with a few well timed trades. See the ‘sign up’ tab at the top of this page if interested. Thanks for reading along.